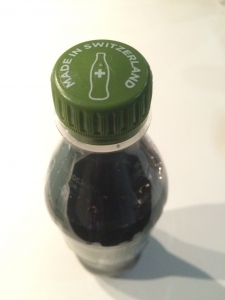 And clearly the Swiss are proud of their local coup, as you can see from the bottle top I photographed. Looks like Coke are either dipping their toes in the water in the Alps first, or, which is a more likely scenario so I’d put my money on it: because Germany’s bigger and slower and more difficult to coordinate so easily, the Swiss quite simply got their act together first. Who knows, maybe the reason it got to Switzerland first will come out later. But what’s clear is that they don’t want the article trickling over the border into Germany. Wouldn’t come across too well with a bottle top like this. And, as is obvious from the Coke website, they’re proud of Coke’s Swiss heritage. Coke, Swiss? Whatever. I’m sure other nations are going green with envy. This entry was posted in Place and tagged Coca-Cola. Bookmark the permalink. in Germany you can already get it at “Va Piano” restaurants. It’s where I heard of it first.